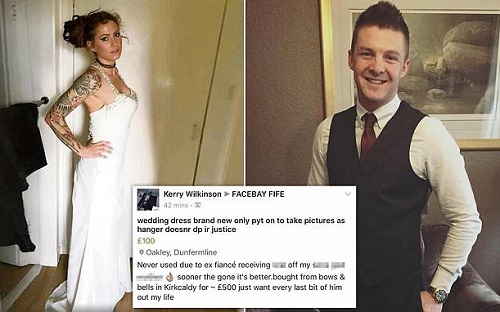 27-year-old bride-to-be Kerry Wilkinson, who took to Facebook to disclose that she's selling her wedding dress after her ex-fiancee cheated on her has gone viral.The wedding dress which she originally bought for £500 from Bows and Bells In Kirkcaldy, Scotland, was sold on the Facebay Fife Facebook page for £100. 'Never used due to ex fiancé receiving o*** off my son's godmother. 'The reaction’s been great. 'I’m not normally one for posting private stuff on Facebook but I was just thinking I need to get this wedding dress out of my life. And I thought the guy’s an a*** hole so I’ll warn all the girls in Dunfermline what he’s like. She added that she was informed of his alleged infidelity with her friend Nicole Martin, 23, after being shown private messages between the pair. However her ex, Dave Notman, 26, denies the claims and says the pair split up before Christmas due to the relationship no longer working and thinks of Ms Martin as his sister. 'I was surprised to see her post and thinking "Where is she getting this from?" I texted her asking Where have you got this information because it’s wrong? But I didn’t even get a reply.